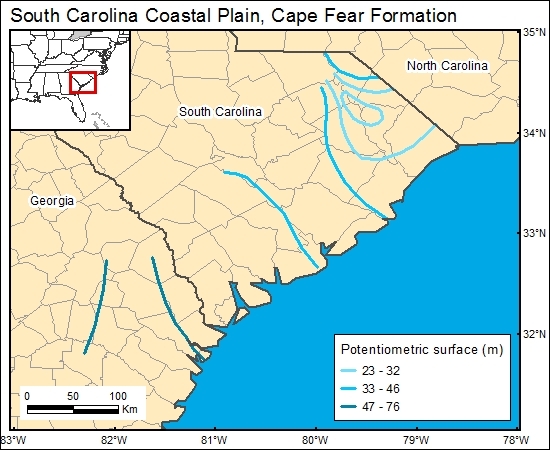 Several authors have characterized ground-water flow in the Cape Fear interval (Aucott and Speiran, 1985; Miller and others, 1986; Aucott and others, 1987; Aucott, 1988; Miller, 1990). A number of authors determined that the deep aquifers directly below the coast are a marine/terrestrial ground-water interface zone in which waters tend to be stagnant. These studies demonstrate that ground-water flow is parallel to the coast. We chose to use the map of Miller (1990) for the GIS because it is regional in perspective but generally shows the same information for South Carolina that several authors have presented. Aucott, W. R., 1988, The pre-development ground-water flow system and hydrologic characteristics of the Coastal Plain aquifers of south Carolina: U.S. Geological Survey, Water-Resources Investigations Report 86–4347, 66 p..